Daniel Bryan will face Samoa Joe for the first time in WWE next week. The winner will qualify for Money in the Bank. Bryan beat Jeff Hardy tonight by submission, using the heel hook as a finisher. Lana and Naomi qualified for the women’s ladder match. The New Day did not reveal who would represent them in the men’s ladder match. Anderson & Gallows beat the Usos to earn a tag title match against the Bludgeon Brothers at MITB. Shinsuke Nakamura announced his title match against AJ Styles will be a Last Man Standing match after the two had a brawl. No intro again this week. 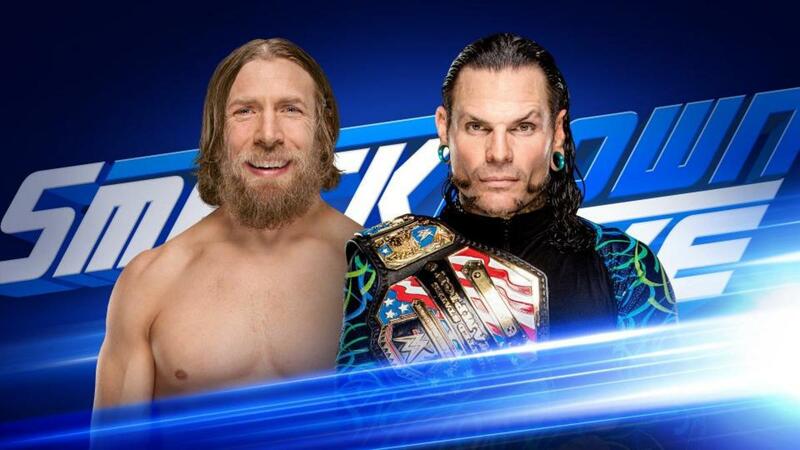 They announced Daniel Bryan vs. Jeff Hardy for the first time ever, and a face-to-face between AJ Styles and Shinsuke Nakamura to reveal the stipulation for their title match at Money in the Bank. The Miz started by bragging about the Cleveland Cavaliers here in Massachusetts. He also answered a question no one was asking by revealing the reality show starring him and Maryse will debut on July 24 at 10 pm (following Smackdown). He then introduced the New Day. Miz asked if New Day were excited about his new show and they were less than thrilled. Miz asked who would be in the MITB ladder match which led to a “Who?” chant. Miz was annoyed, so he asked which one would participate, leading to a “Which?” chant. All three members of New Day said “me,” which Miz didn’t appreciate. Miz accused them of holding each other back, which the crowd booed. Xavier Woods said they weren’t like him. Despite all of his accomplishments, he always thinks about himself first. Miz said he won MITB and cashed in successfully, but that’s not something they could say. He put over Kofi Kingston’s singles accomplishments, but also mentioned he’s failed to win MITB in seven previous attempts. Miz said Big E had all the talent, but he doesn’t take himself seriously enough. Miz said Woods did take himself seriously and put over his successful Youtube channel, but imagine if he could do those videos as WWE Champion. Miz asked them again who would enter MITB. Woods said Big E. Big E said Kingston. Kingston said Woods. Miz was sick of them and their games and said he would win MITB and that he could beat any one of them. New Day huddled and Kingston announced it would be Big E. Not that he would enter MITB, but that he would face Miz tonight. Miz asked the crowd if they wanted to see him face Big E and they chanted Yes. Miz declined. New Day picked up their pancakes and whipped them at Miz, yelling “shame” each time and the crowd chanted along. (Woods hit him right in the face with one.) Miz ran away. Immediately upon getting to the back, Miz was cut off by Paige who made the match official and sent him back to the ring. It’s just one night and one city, but it seemed like the crowd was more into the idea of Woods entering MITB than Big E (or Kingston). Big E was in control and hit a splash on the apron. Woods pronounced the round was over, so he and Kingston ran over to act as Big E’s cornermen. Big E sat down and instead of giving him water, they poured maple syrup in his mouth (and down his chest). Miz managed to yank him off the apron to gain control leading to commercial. After the break, Big E caught Miz and hit him with suplexes and a running splash. Miz tried a DDT but Big E pushed him off and followed with an STO for a nearfall. Miz then kicked Big E’s leg out of his leg and hit the DDT for two. They knocked each other down with clotheslines when Sheamus and Cesaro suddenly ran down and attacked Woods from behind. Kingston made the save, hitting a cool dive where he launched himself off Cesaro’s shoulder (after jumping off the steps). The Bar was too much for him though and they took him out. They announcers said Bryan’s attack on Big Cass last week re-injured his leg. Cass was shown in the back on crutches complaining to a stagehand. Elsewhere, Dasha Fuentes asked Bryan about his second chance. Bryan said he treats every match like it’s his biggest, and he taught Cass last week that if you kick a hornet's nest you’re going to get stung. He put over his match with Jeff Hardy. He called Hardy a legend and a tough challenge. He said he loves a challenge and would tap out Hardy. They showed Lana checking herself out in a mirror ahead of her wrestling match up next. English sang a song to introduce Lana and got the crowd to sing along. Lana entered to her awful singles music. They showed a Tweet from Rusev (who wasn’t there) wishing Lana luck against the Australian lady with the weird accent. Kay and Royce came out next and cut their most annoying promo yet. The crowd chanted “Rusev Day” over them. When the bell rang, English held up a “Lana Day” sign and the crowd chanted it. Royce slapped him, so Lana slapped her. Kay attacked Lana and pushed her back in the ring, but Lana caught her with a high kick and X-factor for the quick win. The crowd loudly chanted “Lana Day” as she celebrated. They kept it short, this went as well as you could’ve hoped. Backstage, Fuentes asked Carmella about facing someone unbeatable like Asuka. Carmella wasn’t worried and reminded us that she beat Charlotte Flair twice, which makes her twice as good as Asuka. She mocked Asuka’s mask and said she would prove that Mella is money. Nakamura said he would take the title and dishonour him. Styles pretended to play along and again told him to announce the stip. Nakamura announced it would be a pillow fight and laughed. Styles laughed too and said he always knew Nakamura was the king of soft style. Nakamura said all he wanted to do was knee-to-face and kept repeating it until Styles cut him off. Styles said he doesn’t care about the stip anymore and Nakamura can’t beat him when it counts. Styles said that this wasn’t the Nakamura we all wanted and no stipulation was going to level the playing field. Styles said he would see him at MITB. Nakamura was about to attack him, but Styles saw it coming. Styles knocked him to the outside, then over the barricade. He cleared the table but Nakamura hit him with a chair. Styles fought back and sent Nakamura “into the WWE universe.” Styles tossed him around, then back over the barricade (away from the crowd). Styles tried a move off the barricade, but Nakamura hit him with a chair. With Styles down, Nakamura began counting him out, but Styles got up. Nakamura was annoyed, so he dropped him over the announce table and hit a Kinshasa. Nakamura then counted to ten. He grabbed a microphone and announced a Last Man Standing match. This was good. They aired a (sponsored) superstar fact for Raw superstar Dolph Ziggler. The teams cut promos on each other before the match. Gallows and Anderson said the Usos blew their opportunity. They said the “blew-it brothers” don’t deserve a shot at the Bludgeon Brothers over the good brothers. Jimmy Uso hit a superkick and Jey followed with a diving splash but Gallows actually kicked out. They set up for a double splash, but Anderson knocked Jey off the top. Gallows and Anderson followed with the Magic Killer on Jimmy for the pinfall win. There were a few “too sweet” chants during the match. During different points of the match, Becky Lynch and Charlotte were shown backstage watching on TV, both at awkward angles. I choose to believe it was the same TV but they just switched places. Deville hit a high spinebuster and Naomi didn’t have the best looking landing. They traded kicks and somehow knocked each other down with jumping kicks. They showed a slow-motion replay, and Deville completely missed Naomi. Naomi caught Deville right on the chin. Naomi picked up the win with a roll-up. Not good. Young interviewed Hardy backstage. He was super excited for a second chance and was already thinking of all the things he can do with ladders. He was excited to face Bryan for the first time but apologized to Bryan because he was about to take flight. Samoa Joe came out for commentary for the main event. The New Day vs. Miz, Sheamus and Cesaro was announced for next week. On commentary, Joe said he didn’t care who won and would smash anyone in the face on the way to becoming king of Smackdown. Hardy and Bryan shook hands to start. They went back and forth early on, but after Bryan did a backflip, Hardy caught him with an atomic drop, leg drop and low dropkick, sending him to the outside leading to commercial. After the break, the crowd chanted “Yes” with Bryan in control. That was short-lived because they collided with crossbody attempts. Joe liked what he saw and said, “I like to study what I hunt.” Bryan got up first and knocked Hardy out of the ring with a dropkick. He missed a running kick and Hardy followed with a running clothesline off the apron. Bryan caught Hardy in the tree of woe and used Yes kicks and low dropkick. Hardy knocked Bryan down and hit Whisper in the Wind for a nearfall. The crowd chanted for Hardy who sold his leg. Bryan then dropkicked him in the leg and followed with Yes kicks. Hardy ducked the last kick and hit Twist of Fate. Hardy went to the top and tried the Swanton Bomb but Bryan got his knees up and followed with a kick to the head for a nearfall. (You could see Bryan telling Hardy to get up for the next spot.) Hardy avoided a running knee and they traded counters. Bryan used a dragon screw and applied the heel hook. Hardy reached for the ropes but then tapped out. Bryan wins and will face Joe next week. Great match and the crowd was really into it. As Bryan celebrated, they cut to the back where Renee interviewed Joe. She asked him about his strong words for Bryan. Joe wondered why whenever he tells the truth, it’s considered “strong words.” He wasn’t saying anything strong or unusual, and next week, he would make Bryan go to sleep. They cut back to Bryan who led the crowd in Yes chants. This was a really good show.